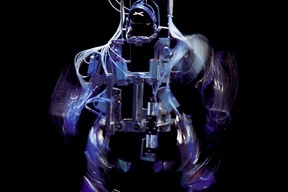 The robot Requiem is an interactive pneumatic exoskeleton made of aluminium sheets, stainless steel and nineteen pneumatic pistons enabling movement of the knees, thighs, groin, hip, shoulders, elbows, jaw and hands. 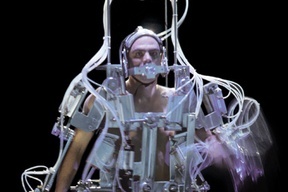 The robot is suspended by the head from an iron support, hanging a short distance from the floor. As an installation Requiem has eight sensors located around the exhibition space and they can be activated by the spectators. Each one of these sensors initiates a sequence of movements and they become increasingly more complicated as one moves closer to the robot. The movements of these mechanical choreographies have suggested names such as: Greeting, Walking, Contraction, Falling, Swedish Gymnastics, Tai chi, Flamenco and Contemporary Dance. Taken from the symphonic genre Missa pro defunctis. the title Requiem draws the idea of the prosthesis to its logical extreme by maintaining the appearance of life and its mechanical movements even after death. The immobility imposed by death could by sarcastically outwitted by this mechanical sarcophagus moving the mummy contained within. However this robot also represents, at another level, a device for transcribing movements, a mechanism for creating choreographies. Perhaps Requiem, or a similar device, might serve as a movement transcription device for choreographers. Helmet & hands: Christian Kohn. Producer assistant: Patricia Bofill, Sandra Port. Pneumatic Robot de 190 high x 90 width x 90 width cm. Steel support 270 high x 175 width x 175 width cm. Control box: PLC, relees, electroválvulas.